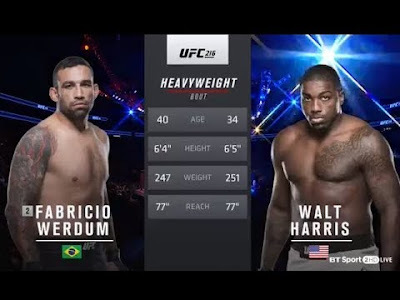 Round 1: Werdum grabs a single leg early on and he gets Harris down to the canvas. From half guard, Werdum easily transitions into full mount. A brief scramble ends with Werdum locking on an armbar, and this one is already over. Official result: Fabricio Werdum def. Walt Harris via submission (armbar) at 1:05 of Round 1.